This first volume (of three), covering chapters 1–8 of the confession, explains what we need to understand about Holy Scripture, God and the Trinity, his decree, creation, providence, the fall into sin, God’s covenant, and Christ the Mediator. Every discussion is geared toward bringing us to a deeper knowledge of and greater love for the doctrines of grace set forth in God’s Word. A clear and undestandable exposition. 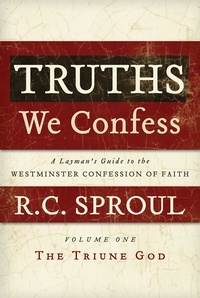 Dr. Sproul has done a tremendous job of making the Westminster Confession speak to the average christian.It did much to bolster my faith to grasp the truths of this authoritive creed.